Superstar sprinter Redzel already has a piece of history being the inaugural Everest winner and he’s on the cusp of more in The Shorts at Randwick on Saturday. Redzel will surpass Chautauqua’s prizemoney tally if he runs top three in The Shorts. (Pic: Steve Hart). It’s been 41 years since a horse has won the Group 2 sprint in successive years – King’s Favourite in 1976 and 1977 – and since its inception in 1867 only five horses have managed multiple wins. And Redzel only has to finish in the first three to assume the mantle of Australia’s highest prizemoney earning sprinter as he sits just over $10,000 shy of Chautauqua’s $8,821,935. Trainer Peter Snowden says Redzel has improved since his first-up win in the Concorde and is going into the race confident he’ll again produce his best. “He’s tightened up nicely, his coat hasn’t come all the way through but it looks better,’’ Snowden said. Interestingly, last year Redzel became the first horse to complete the Concorde-Shorts double. With eight wins from his last 11 starts, and 13 of 26 overall, it’s easy to place the expectation on Redzel that most races he contests are a formality. While the Group 2 $200,000 Bowermans Office Furniture Shorts (1100m) is billed as a mini-Everest, with a third of the field for the October 13 feature engaged, Redzel carries that expectation as a dominant $1.80 favourite with TAB. “It is difficult to win all the time but a horse like him, while he’s not a Winx, he’s very genuine,’’ Snowden said. “He tries so hard every time he goes out. He handles it wet and dry, good gates and bad gates, the variables that stop other horses. Punters Intel data out of the Concorde showed Redzel ran 32.47 for his last 600m and 11.17 for his final 200m. Snowden said Redzel has drawn ideally in between the expected speed of Invincible Star and Ball Of Muscle which allows jockey Kerrin McEvoy all the options he needs. “There’s good speed but one thing about our bloke is we don’t have to be dictated to, we just ride our own race,’’ he said. 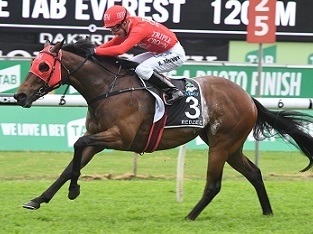 Another win will ensure Redzel tightens his hold on favouritism for the $13 million TAB Everest (1200m), he’s $5 ahead of Saturday, but the performances of English ($17), Invincible Star ($26) and Brave Smash ($26) will tell punters plenty about their standing. As it was last year, The Shorts will be Redzel’s final lead up to the TAB Everest and Snowden confirmed the six-year-old will barrier trial before the big race. The Snowden stable also holds sway in the market for the Listed $140,000 Schweppes Heritage Stakes (1100m) with promising colt Neutrality the $2.30 TAB elect. Neutrality bumped into Golden Rose favourite Graff when he resumed in the San Domenico Stakes three weeks ago where McEvoy reported he wasn’t happy in the shifty ground. “He’s trained on really nicely, I thought there was a lot of merit in his run the other day,’’ Snowden said.